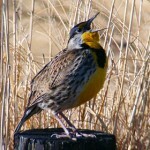 Variable song consists of clear and flute-like whistles in short, distinct phrases. 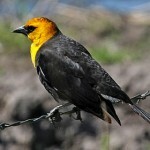 Description: Adult male has black head, throat, back, and black T-shape on orange tail; underparts and rump are bright orange; orange shoulder patch on wing; and single white wing bar. Female has greenish-brown faintly streaked back; and orange-yellow underparts. Habitat: Wooded river bottoms, upland forests, shelterbelts, farmsteads, and partially wooded residential areas with tall shade trees. 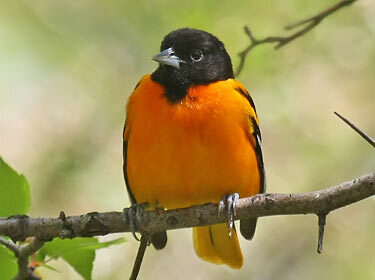 Fun Facts: Young male Baltimore Orioles do not achieve adult plumage until the fall of their second year. 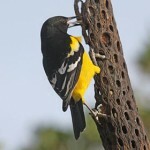 Additional Information: Once considered along with western Bullock’s Oriole to be one species, the Northern Oriole. Apparently hybridizes with Bullock’s Orioles where ranges overlap.